Bernie Sanders is creating a tremendous amount of excitement in the Democratic Party, but much of the media is trying to downplay this. Politico showed why it is frequently called Tiger Beat of the Potomac in an article which totally misses the big story of the year. The authors ask, Can Bernie Sanders Win the Love of a Party He Scorns? They miss the point that Sanders’ independence from the Democratic establishment is one of his strengths, not a weakness. This year both parties have a candidate who is outside the mainstream but, unlike Donald Trump, Bernie Sanders can win elections and can make an excellent president. 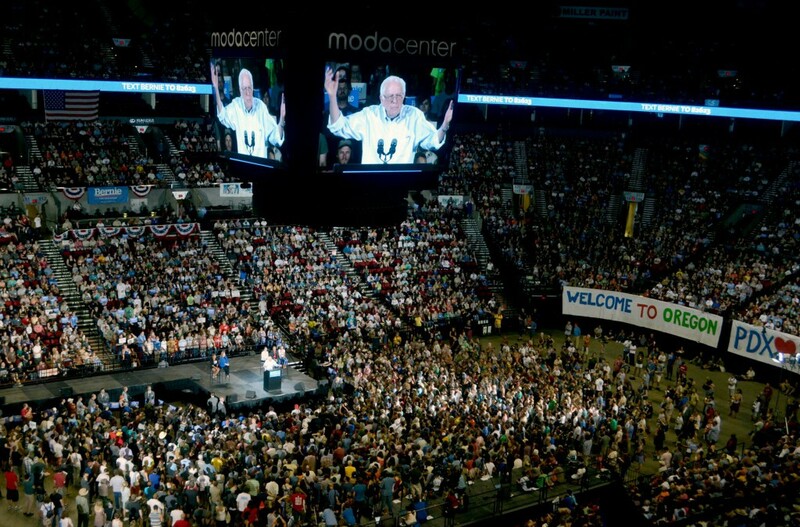 The support for Sanders can be seen in the crowds who come to see him, such as 28,000 in Portland last weekend. He is pulling in the biggest crowds of any candidate, from either party. Many in the media claim he is unelectable, as if his twenty-five years in Congress still leaves him too far outside the system to be taken seriously, Even the Politico article cited above notes that he was successful at passing amendments in a conservative Congress. National Nurses United recognized his track record in endorsing him on Monday. Sanders is surging in the polls in some states, including the first contests in Iowa and New Hampshire. He has pulled into a statistical tie in New Hampshire, and we have seen in past elections that the winner of the early contests receives a major bounce in the national polls. General election polling shows him gaining in strength in the battleground states while support for Clinton is dropping. While anecdotal findings have little predictive value, I cannot help but be impressed by the support for Sanders on social media. One of his comments on the Republican debate became the most retweeted comment of the night. I am amazed that one of my early posts on Sanders entitled Former Clinton Adviser Predicts Bernie Sanders Will Beat Hillary Clinton has received over 16,000 Facebook “Likes” as of this evening, and the number is continuing to grow. When my wife and I wore a Sanders t-shirt while traveling in New Hampshire and Maine last month numerous people came up to me to say how much they love Bernie. It was if I was a celebrity just by wearing the shirt. Democrats have had a problem in recent years. Polls show a majority supporting Democratic positions but Democrats have been losing elections, except for the two years Barack Obama was on the ballot. Democrats having been losing badly in Congress and many state governments. Returning to the Politico article, the truth of the matter is that many of us who have voted Democratic also scorn the party, and many other potential voters stay home. While some partisan Democrats might oppose Sanders for being an independent, many Democrats, as well as independents, will be more likely to support Sanders because of his independence. Democratic leaders base their strategy on getting people to vote against the Republicans, not necessarily for the Democrats. They ran Republican-lite candidates in 2014, and were slaughtered in the midterms as many Democratic voters saw no reason to vote. Now the party leadership is pushing the candidacy of another Republican-lite politician for president, hoping that things will be different in a general election than in a midterm. While certainly preferable to the Republicans, Hillary Clinton’s views are far too close to those of the Republicans for many Democratic voters to accept, no matter how much she now tries to copy ideas which Sanders promoted years ago. Rather than embracing a candidate who is pulling in such popular support, the Democratic National Committee has been trying to rig the contest to favor Hillary Clinton. While Republicans have started debating, the DNC is limiting Democrats to six debates, starting in October, and forcing candidates to agree not to participate in any debates not sponsored by the party. How undemocratic can the Democratic Party be? People are supporting Sanders because he is seen as honest, and outside the dirty politics we have experienced. Instead of embracing this opportunity, the Democratic leadership is pushing Hillary Clinton, who is involved in one of the biggest scandals since Watergate, placing not only the presidential ticket but all Democrats running in 2016 at an unnecessary risk of defeat. It makes no sense to push for a candidate who is rightly seen as dishonest by a majority of voters , and frequently shown to be dishonest by fact checkers, when there is a far better, and honest, alternative. Initially Clinton supporters claimed that it was necessary to support Clinton in order to avoid a Republican victory. Will they now back Sanders as the polls increasingly show that he would make the stronger candidate in the general election?